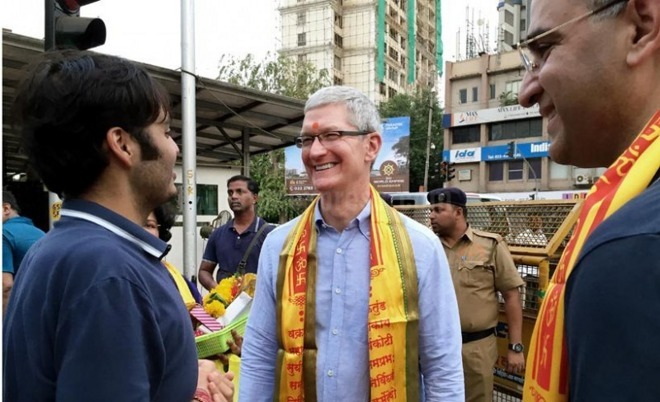 The iPhone may have a small marketshare in India, but the company isn't worried about that and is instead holding out for the long-term, Apple CEO Tim Cook said in an interview published on Friday. "We are in India for the next thousand years," he told The Hindu. "Our horizon is very long. We are focused on best, not most. So it doesn't bother me that we don't have top market share." In stark contrast with many countries, the iPhone has just a 2 percent share of the Indian market, where companies like Samsung and Micromax are dominant. While Cook has suggested this could improve when new 4G networks come online this year, the overriding issue is typically believed to be pricing, since new iPhones are often vastly more expensive than other options available in India. Cook reiterated his position, referring to his talks with various Indian telecoms firms. "I see a great technical collaboration between Apple and main carriers in India and to make sure the iPhone works incredible on those networks. The feedback I have thus far is very positive on that," he commented. "We push really hard, in some ways they think we are crazy, but they love it as well that someone is pushing them hard to work together to solve the most difficult problem." On the topic of the Indian government declining Apple's application to import used iPhones —a way around cost issues —Cook said the company would continue to push for an agreement, and would offer new warranties if it does sell used phones, much like it does on refurbished products elsewhere. The executive declined to say for certain whether some iPhones might eventually be manufactured in India, but stated that new development-oriented facilities in Bengaluru and Hyderabad would be just the beginning of Apple's local footprint. Cook is in the final stretch of his first business trip to India as CEO, which began earlier in the week. On Saturday he's expected to meet with the country's Prime Minister, Narendra Modi.